Interesting as that is, you may be asking yourself what that has to do with business. To start with, the leader of a group, the person who has the attention of the rest is likely to be the one whose emotions will come to dominate the group. So if the leader is positive and conveying anticipation for the future, that feeling will infect the others, influencing them to approach their own day and work with the same enthusiasm. The opposite is equally true. If that leader is having a bad day or their level of enthusiasm is down that can become the prevailing attitude of the whole group. We’ve all had the experience of feeling buoyed up after talking to someone, or conversely feeling weighed down. It’s not just what they said that’s affected us, we are actually being influenced by their mood, just as we in turn are influencing others. Equally important to what you say, is how you say it. Are you standing up tall? Are you smiling? Are you making eye contact with the people you’re talking to? Humans are more adept at picking up nonverbal cues than verbal ones. Even if you get a low energy start to your day, adjusting your body and actually putting a smile on your face will not only influence your own mood, it will influence the moods of people you interact with throughout the day. 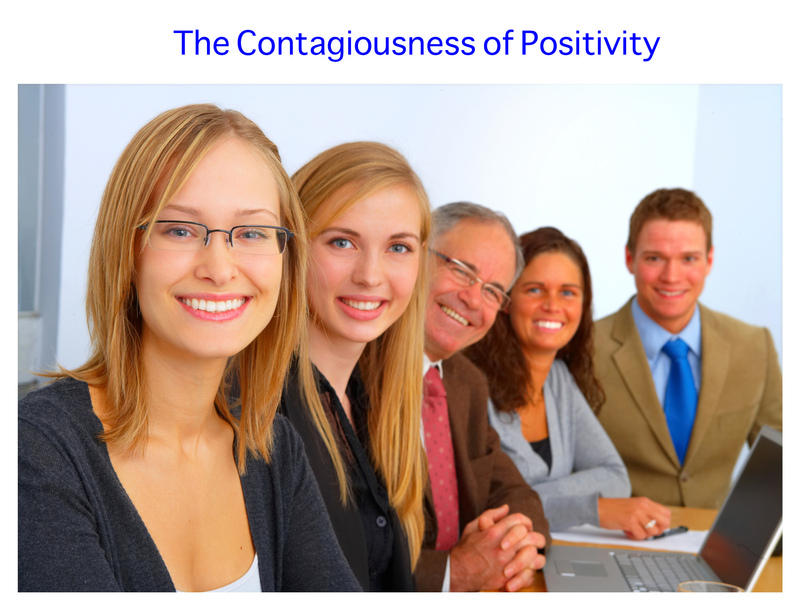 If you are in the company of a negative person and you feel your mood starting to plummet, recognizing the influence they’re having on you will help you avoid the fall. Limit your eye contact with that person. Remind yourself that their emotions are not yours. A change of scenery will help. Going for a walk, talking to someone who inspires you, a few centered deep breaths and of course returning a smile to your own face. You could also try infecting them with some positive emotions! As mentioned earlier, it’s entirely possible to change how you’re feeling inside by adjusting your outside. Generally we smile when we’re happy. There’s a mind body connection between the action and the feeling. Putting a smile on your face can actually help you feel better. Same goes for how you hold yourself. Presenting yourself as a confident looking person, standing tall, shoulders back, can actually help you feel more confident – while at the same time instilling confidence in those around you. The circle of life!